Sometimes you wake up picturing a new project in your mind and know you just have to make it! That happened to me recently with this doll quilt. I woke up picturing a paper pieced design that incorporated long rectangle sections that alternating directions to create a chevron shape. As I was sketching out the design I realized the rectangle pieces gave this project a totally different look than any I had done before. Over the years I have done a lot of paper piecing, from string piecing (like this project) to creating actual designs (available in my free patterns section). I paper pieced (or foundation pieced) four long skinny rectangles in the string piecing method. 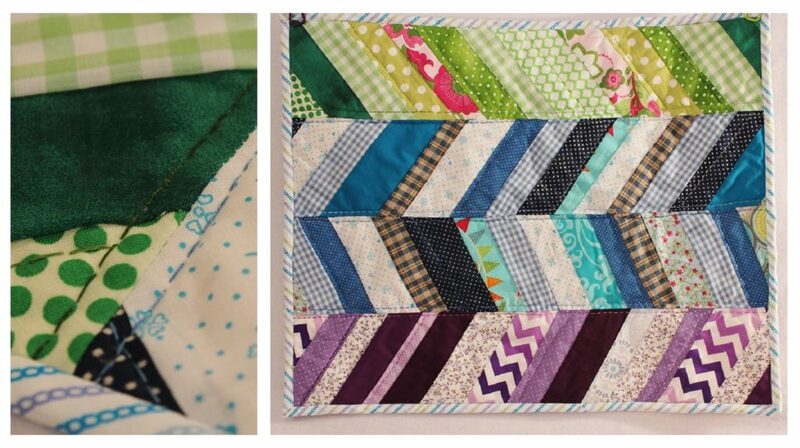 String piecing is using strips of fabric in any width to fill up the foundation paper to create your block. 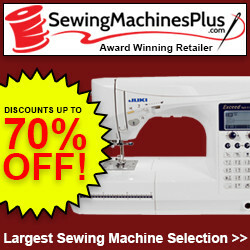 String piecing is usually done on an angle. 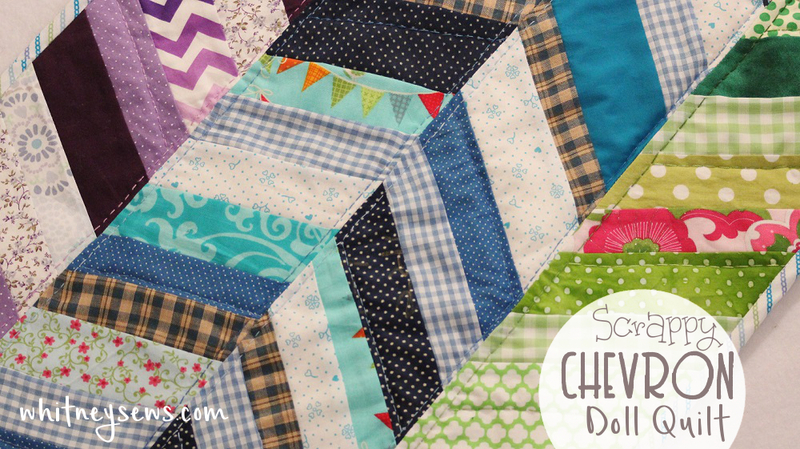 I then used the four pieces to create a scrappy chevron design. I made the entire quilt using scraps from my stash, but a few fat quarters cut into strips, and another for the backing, would also work great for someone without a large fabric stash. The continuous bias binding can even be made using a fat quarter. This quilt was designed to be a doll quilt, but would be easy to make a little larger for a baby quilt, or smaller for a mug rug. To make the doll quilt cut four pieces from paper measuring 5 X 22 inches. Sort through your fabrics and decide what colors you want to use. Then begin sewing the pieces together onto the paper. Make sure to backstitch at the paper edge each time so your seams stay strong when tearing the paper away. Trim away all the excess fabric. This is easiest when using a long ruler and rotary cutter. Tear the paper away and you’re ready to sew the four rectangles together. Then it’s time to make your quilt sandwich. *If you want to use a fat quarter for the backing you might need to trim down the pieced front* To make the quilt sandwich layer with the backing right sides down, then the quilt batting, and the pieced top right sides up. There are a few different ways to baste the layers together, but the easiest way is using spray basting. Once the layers are basted together the quilt can be quilted any way you like. I chose to hand quilt mine using variegated embroidery floss, two strands at a time. When you’re done quilting trim all the edges to they are straight and add your binding. Finished quilt measures approximately 18 X 22 inches. Click HERE to watch the step by step video tutorial! Interested in the supplies I used? A tutorial for making your own continuous bias binding is coming soon. There will also be another small quilt project coming up in my DIY Disney series, so keep an eye out for those! Until then, happy sewing! This entry was posted in Blog and tagged DIY, Doll Quilt, Fat Quarter Project, Hand quilting, How to, Quilt.